← Ham Radio: How Much Does It Cost to Get On HF? This is a post written in response to a question from a friend about whether the hum on her line was her problem or the phone company’s problem. I’m providing lots of pictures for a step-by-step way of testing. Please note that nothing here will violate the telco’s lines or property—they would tell you the same thing I’m telling you here, except I’m actually showing you how. 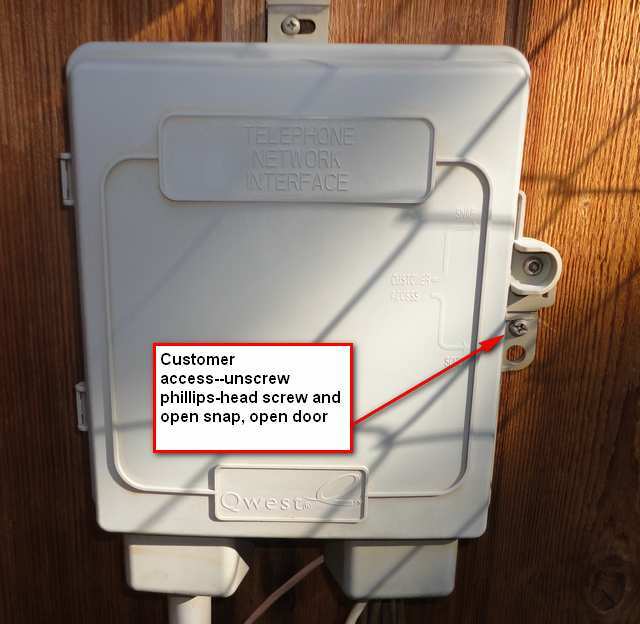 You will need a Phillips screwdriver and a plain old-fashioned corded telephone (one that only plugs into the phone line and doesn’t need electricity from a separate wall-wart). First, locate the telco interface box. It should look something like the following photograph. It’ll likely be about four feet off the ground. 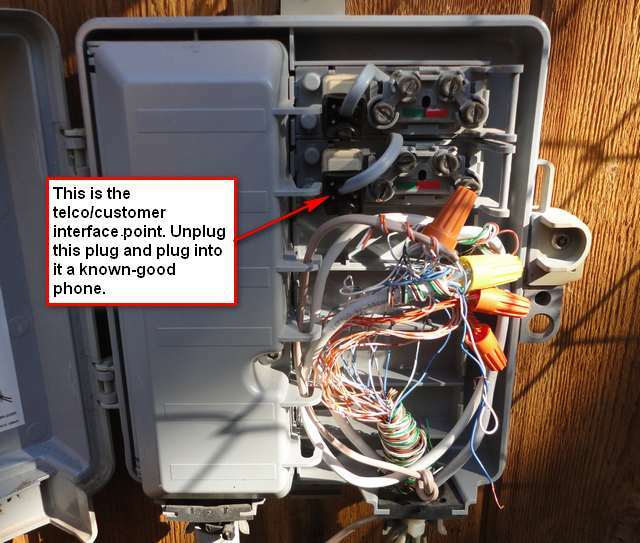 This is the box that houses the interface between what belongs to the telephone company and what belongs to you. Sometimes it's called the demarc, meaning it's the demarcation between what's yours and what's the telco's. Open the box using a phillips screwdriver. Note there is a tab that should be pushed back to help open the door. Inside you’ll see a mass of wiring, which you can ignore. All that wiring is yours, by the way, not the telephone company’s. Inside of interface box. Note the arrow which shows you what you'll need to unplug. In this case my primary line was the second (lower) of the two plugs. 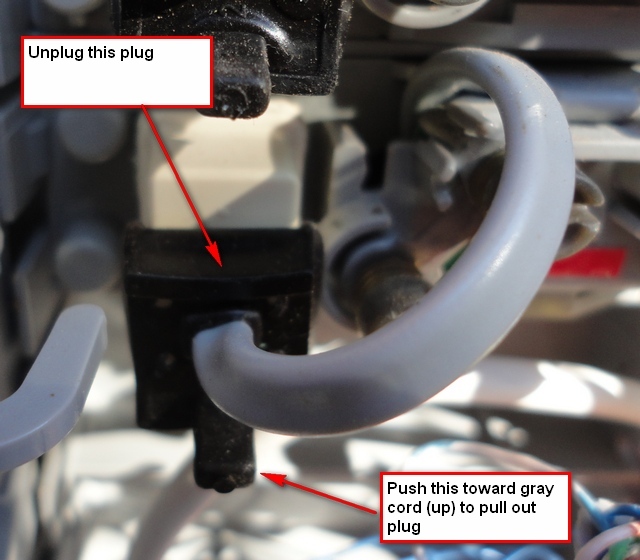 If you have multiple plugs, you may need to test each one to see which is your primary line. Here’s a closeup of what you need to unplug. 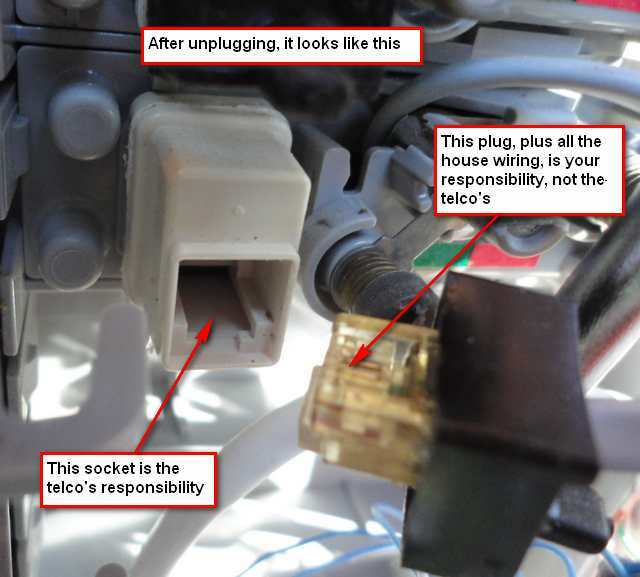 After it’s unplugged, it should look like this—it exposes a telephone jack (socket). What it looks like unplugged. This is the demarcation between what belongs to the telco and what belongs to you. 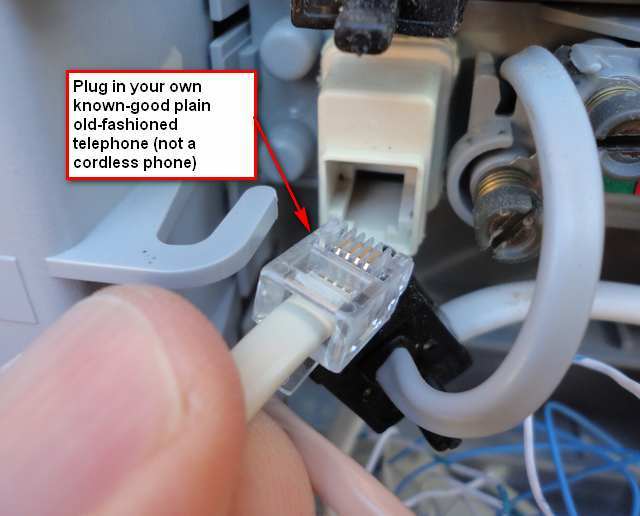 Plug into that jack your known good phone, as shown below. Once you’ve plugged this in, use the telephone. You should hear dial tone. You should be able to make a call (go ahead and make one to be sure). You should hear dial tone. You should be able to make a call. Okay, now here’s the skinny. If the problem you’ve been having (for example, hearing a hum) is not present, then the problem is in your house wiring and is your responsibility, not the telco’s. If, however, the problem persists (for example, that hum), then the problem belongs to the telco and you should call them to repair it. 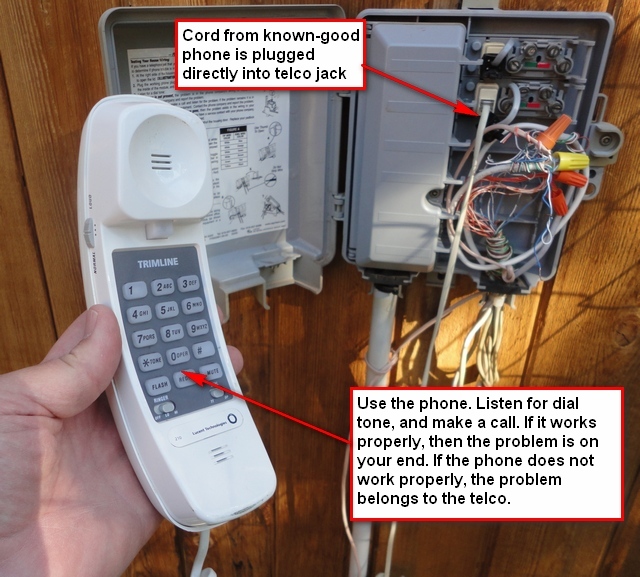 This entry was posted in Computer Tips and tagged telco demarcation, telco interface, telephone troubleshooting. Bookmark the permalink.